• Spacer coupling with easy to remove snap design. • Suitable for back pull out design pumps. 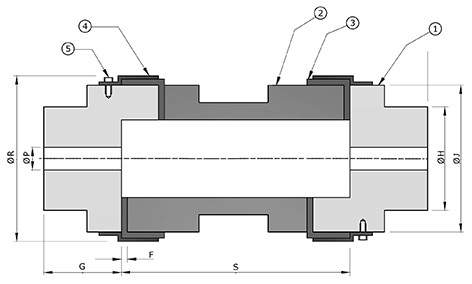 Spacer of Aluminum to reduce load on the extended shafts. • Can take larger mis - alignments because of two flexible membranes. 1000 1500 3000 kg-m PILOT MAX. Ø J Ø R Ø H BORE G S JAW & BODY F FOR SPACER LENGTH KG.